This is a calculator App with two major differences. Firstly you input information directly onto the screen (there is no keypad) and secondly the App solves equations. It is this latter function which is really exceptional. There's a handy tutorial which you might find helpful but, the App is so intuitive that you can easily get started without watching it. The settings enable you to choose a default of Degrees or Radians, or allow you to choose on each appropriate calculation. You can also set the default number of decimal places, as well as better rejection of palm on screen syndrome, and handling of left-handed entry. you are invited to send anonymous data to the developer to help their development efforts. What you have is basically a blank screen with icons for undo, redo, trash/bin/waste (whatever you call it). In effect this is everything you need. Use your finger or stylus to enter a calculation, followed by an equals sign. Your input is translated into legible text, complete with answer. you can then correct or alter your information directly on the screen. This is impressive but pales into insignificance when you enter start entering more complex formulae, complete with roots, factorials, trigonometric, and log functions. The handwriting recognition is excellent (as one has come to expect from Vision Objects). The App is free and supported by advertising for companion Apps. This promotion is very discreet. 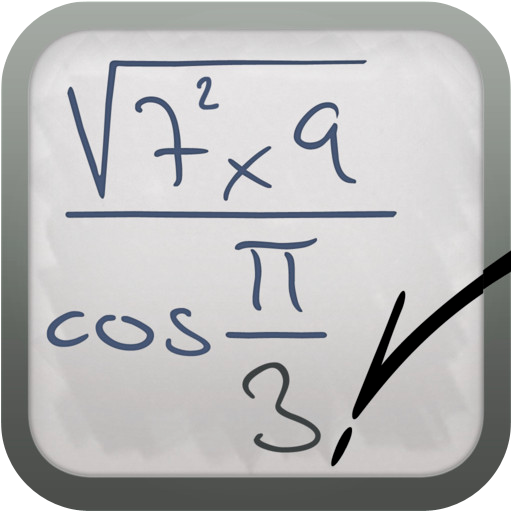 If complex calculations are your daily routine then, this App is a must. The handwriting recognition is very good... anything that can read my scrawl must be effective. The tested results were all flawless, although the square root of -1 proves a challenge too far... and there are plenty of us in that club. No issues, and you can share results via Twitter and email. You can get MyScript Calculator here and support for the App here.